Vietnam isn't a land of perpetual warmth and humidity. Consider that this diverse country is actually about 1,600 km north to south. That's the equivalent of spending a November in Los Angeles, California versus Portland, Oregon. Vietnam can be split into several weather regions depending on latitude and elevation. The highest point in Vietnam is about 3,000 meters, while the lowest are the beaches at sea level. North Vietnam, which is home to Hanoi and Halong Bay, has two distinct seasons: summer and winter. Generally, summer lasts from May to October, and winter from November through April. If you plan to travel to the north from November to March, plan on cooler and dryer weather ranging from the 70s Fahrenheit during the day to the 60s F and 50s F at night. December and January are the coldest months in North Vietnam. 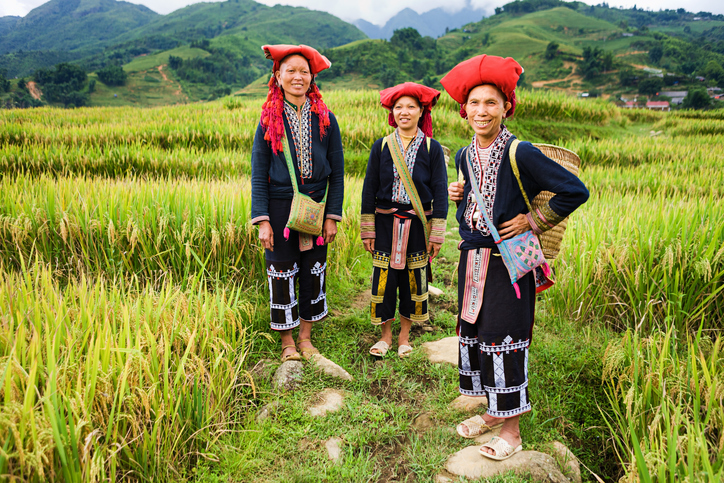 If you plan on visiting one of the mountainous northern regions, such as SaPa or Ha Giang, plan on wearing a coat from October through January as temperatures can dip into the 40s F. From April to September, the mountains experience an increase in rain. From May to October, most of north Vietnam will be hot and humid. Central Vietnam has so many things to offer, from historic sites and caves to beaches and amazing cuisine. This region can be divided into the coast and the Central Highlands, where rich Buon Ma Thuot coffee is created. The coastal region, home beautiful riverside cities like Hoi An, is generally dryer than average throughout most of the year. However, because the coast is separated by a small mountain range, likely you'll find differing weather situations depending on whether you’re traveling north or south. Oftentimes you’ll even find that the weather in Hue doesn’t line up with weather in Hoi An, even though these two cities are just over 100km apart from one another. From December to January, you'll find slightly cooler temperatures along the coast, but you'll rarely see the thermometer drop below 75 Fahrenheit. Between January and August, you'll experience the highest temperatures, and September to November will bring increased rains and occasional typhoons. The Central Highlands are always hotter than the coast, and temperatures stay fairly consistent throughout the year, with temperatures spiking in March and Aril. The Central Highlands have two seasons: dry and rainy. The rainy season lasts from May through October, and the dry season from November to April. When most people picture Vietnam's weather, here's what they're thinking of: the southern regions, which include Ho Chi Minh City, the Mekong Delta and the Con Dao Islands. Temperatures here remain constant year-round, with weather patterns split simply into wet and dry. most rainfall. 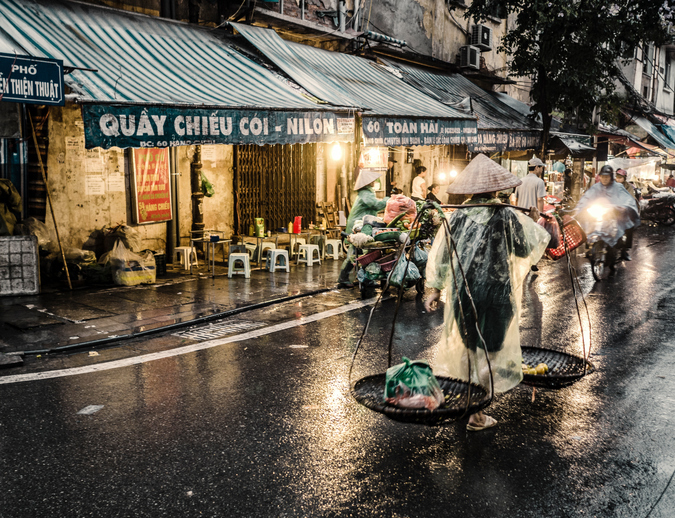 During these seven months in South Vietnam, you'll experience rain on an average of 25 days each month. These rains are generally very heavy, but won't last all day. Most rains occur in the afternoon. The dry season in South Vietnam starts in November and will last through April. These are also the hottest months. If you're planning on taking in all of Vietnam by travelling north to south during your stay, the best time to visit the country will be late spring or early fall. Bring layers so you can enjoy the beaches as much as the mountains, and plan for some rain. Much like Vietnam itself, the history of the Vietnamese dong is expansive. If you're not at least somewhat familiar with VND, your first money exchange experience in Vietnam can certainly lend to confusion. First off, the exchange rate is pretty wild so don't be surprised when one trip to the ATM makes you an instant Vietnamese millionaire. 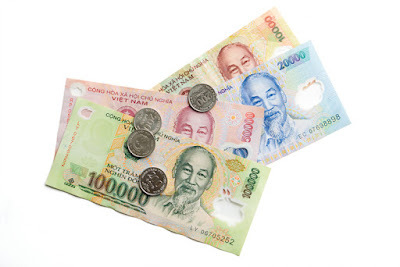 While the rates of exchange do vary, one dollar generally hovers around the 20,000 VND mark. Vietnamese notes range from 500 to 500,000, however, most establishments don't deal in notes below 5,000. Consider that the 500 note is the equivalent of only about 1/50th of a dollar, so there's just not a ton of use for this small of a currency. We find that the 2,000 VND notes (roughly $.10) do come in very handy for public toilets. Cash is king in Vietnam, and most cities have the ATMs and exchange bureaus to prove it. To minimize your chance of theft, we strongly recommend withdrawing money only as you need it, not for your entire trip. While Vietnam is considered generally safe because violent crimes are rare, theft does happen. Foreigners are often targeted in purse snatching or pickpocketing, so it's important to protect yourself by being vigilant about your money. Simply put, don't bring valuables with you. Be aware that pickpocketing doesn't just happen in crowds; many thefts occur in scooter drive-bys where purses, phones or IDs are snatched from unsuspecting tourists who are walking or even riding on the back of motos. Lock your passport in your hotel safe. Depending on your bank, ATMs can impose a limit on how much you can withdraw in one day. Although businesses will accept foreign currencies, particularly US dollars, we recommend exchanging your money before you spend it. Shops and restaurants accepting dollars will use their own exchange rate, which will invariably be higher than the official going rate of exchange. Never exchange money on the street. If the exchange rate looks too good to be true, it is. VND coins have not been accepted since 2014. You can still find these beautiful historic souvenirs up for sale, however, don't accept them in exchange as they have no market value. VND isn't accepted outside of the country and it'll be next to impossible to convert your money back to spend at home, another reason why you should only take out what you need. Consider anything you don't spend a souvenir. With so many notes to choose from, it can be easy to become confused in the hustle and bustle of the markets or restaurants. The colorful paper doesn't always help, since some notes are deceptively similar in color. With a careless glance, you may pay a vendor 200,000 VND instead of VND 50,000, or receive 150,000 less in change. If you're not familiar with foreign travel and you find money exchange or bargaining a bit intimidating, you may want to consider letting your guide negotiate for you. 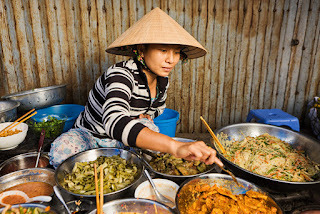 Vietnamese cuisine is diverse, and features a wide variety of spices, meats and vegetables. The ingredients are fresh and most food preparations are comparatively healthy. 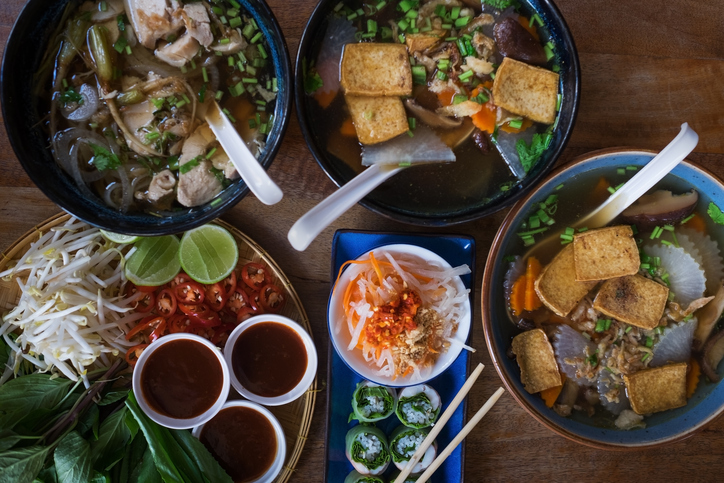 From Hanoi to Hi Chi Minh City, you'll find distinctive characteristics in Vietnamese cuisine. Vietnamese cooks use bold flavors to create contrasting dishes that include rice, noodle, vegetables, fruits and coconut. This cuisine evolved over long periods of time and is based on the country's own history and food availability, which means it’s a little bit different depending on region. Central Vietnamese cuisine features big and spicy tastes, and includes many dishes with Thai and Cambodian influence, such as beef soups or noodle with pork. You'll also find plenty of delicious banh mi in this region, crispy French baguettes with about 70 years of Vietnamese influence. The Northern cuisine is famous for hearty pho or bun cha (fried pork) with vermicelli. In the south, things get much sweeter as sugar and coconut milk are central ingredients to many dishes. While in Vietnam, we recommend sampling a variety of regional foods, but staying away from raw ingredients. Since you didn't grow up there, you haven't developed the right gut bacteria to deal with regional microorganisms. At best, you'll experience a bout of traveler's diarrhea; at worst, you'll ruin your vacation. 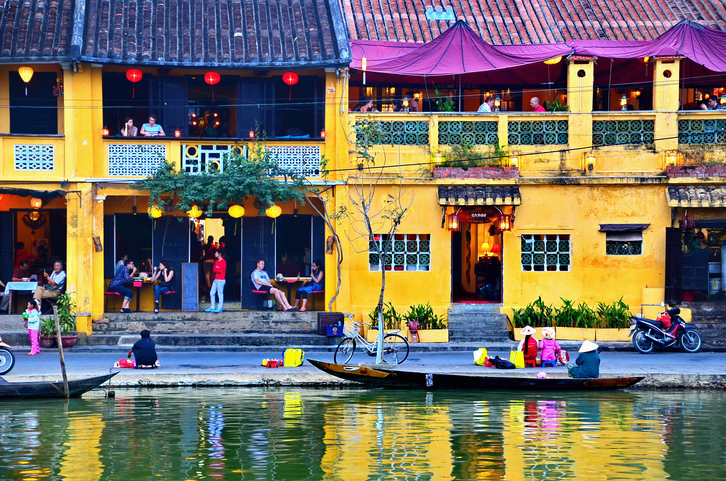 Many things in Vietnam are simply not on a tight schedule so you'll find you'll have much more fun if you're flexible and don't over pack your schedule. Many people underestimate how much time they'll want to take to simply wander or take in an afternoon coffee. An easy itinerary will allow you to spend more time on a new discovery. Err on the side of under-booking rather than over-booking. Additionally, be aware of the timing of your itinerary. Some trips into the mountains will leave or return at odd hours, with the potential to leave you waiting on the sidewalk in the wee hours of the morning for an inn or a restaurant to open. If possible, use a Vietnamese specialist as a travel guide. We use LVPtravel.com because they will customize an itinerary around your interests and they'll be able to help you plan trips so you’re never left stranded. Using Vietnam Airlines is always a positive and very affordable experience. The service is excellent and you'll leave and arrive on schedule. 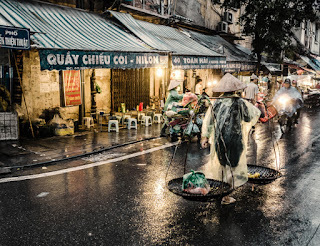 You'll be amazed at how quickly your photo library will expand on your trip to Vietnam. From rice fields and mountains to beautiful buildings, stunning beaches and interesting people, Vietnam is a place you'll always want to remember. Although it might be tempting to try and sneak pictures of people because you feel like it might be awkward or insulting to ask for permission, consider that it's far more awkward and insulting to be caught taking a picture you didn't ask for. If you find yourself wanting to take pictures of people, strike up a conversation with them and politely request a photo. Some folks will readily allow it, while others might make stipulations. This photo of a Dzao woman in customary dress cost us a $2 purse, a small price to pay for such a priceless picture.